Folks ask me what is the best reference book to learn more about AK rifles and the variations that are made all over the world. The Grim Reaper Second Edition book by Frank Iannamico is, hands down, my number one recommendation and I say that based on owning somewhere over a dozen books on the AK rifle. This is definitely a book you will want to add to your library. I literally keep it on the right side of my desk for quick access when I need to look something up. How does Ronin’s Grips’ polymer handle high heat? I regularly get asked about how well our handguards will withstand heat and why we don’t have a heat sink. 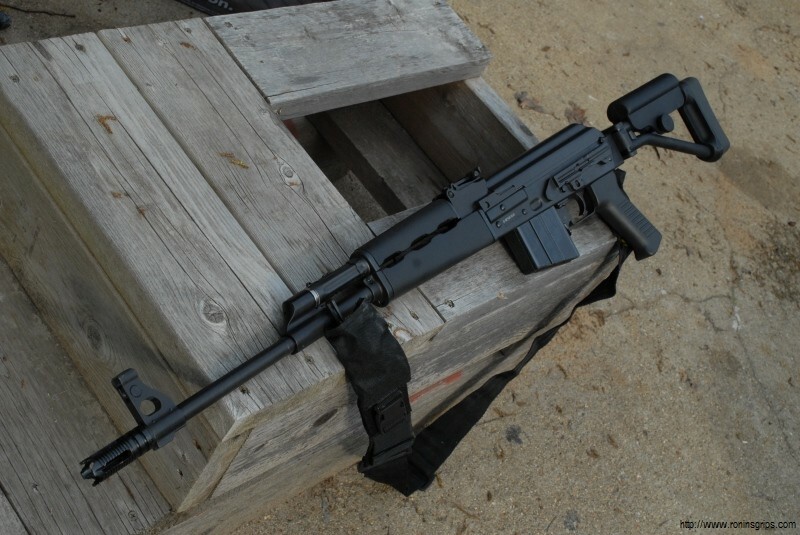 I have class III SOTs building with my handguards and haven’t had complaints. Some of them have told me that heatsinks are over rated and once they are hot then all bets are off. 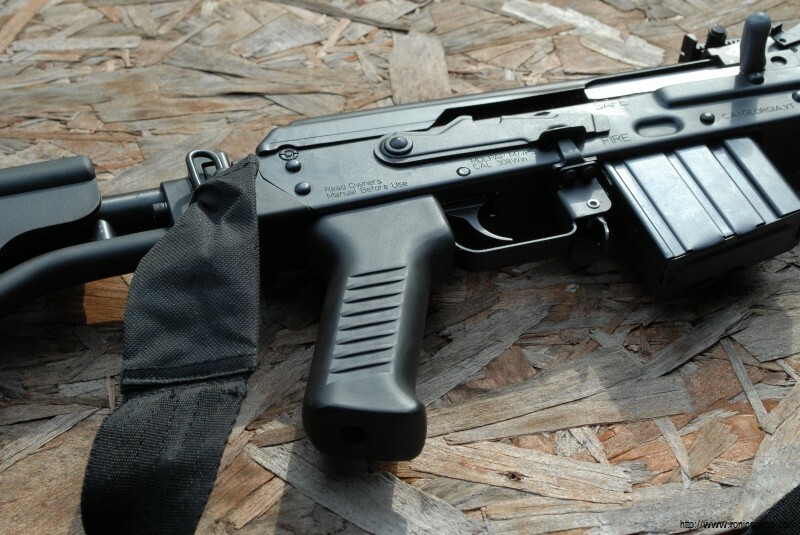 The Yugo M85/M92 handguards we sell are made from molds cast from the originals, which are very thick and our traditional M70 handguards are the same way. 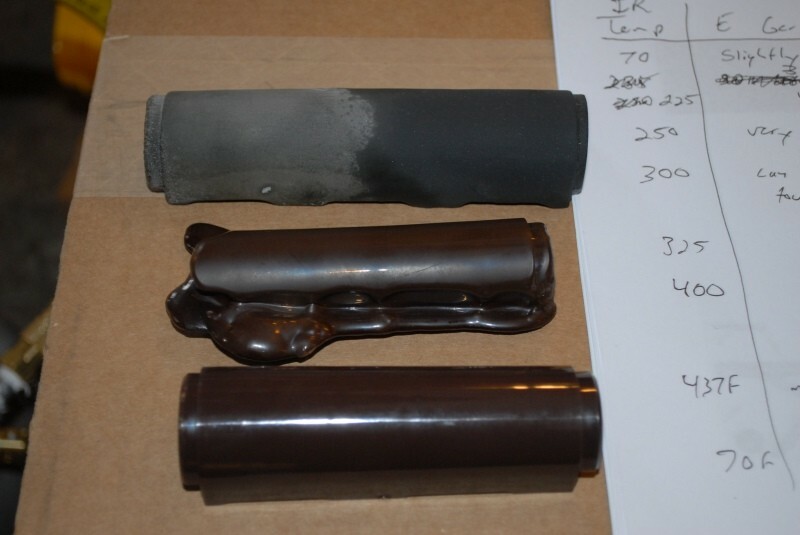 You have to shoot a firearm quite a bit to heat the barrel up and then heat the special high-temp urethane and glass fiber composite all the way through before it will soften. From a technical specification perspective, the manufacturer says the base urethane, without the glass fiber reinforcement we add, has a technical temperature deflection spec of 257F, meaning it will not deform until past 257F. 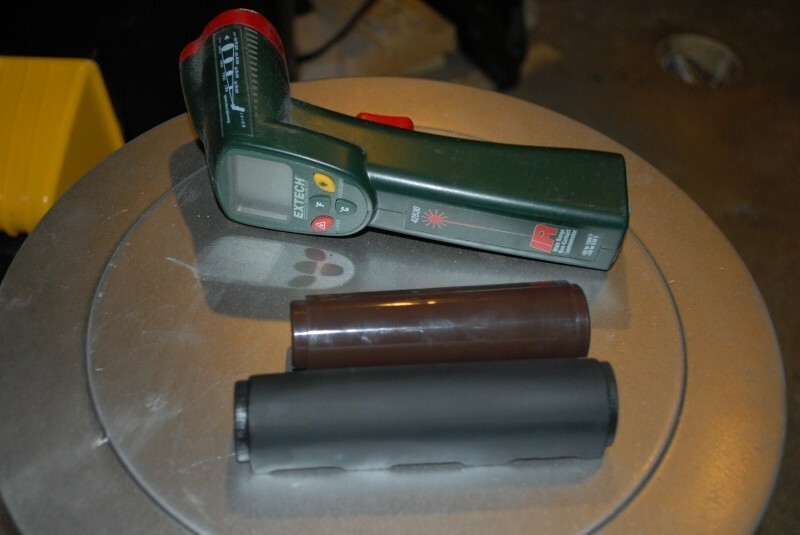 To test this, I took one of our black gas tube covers, a digital IR thermometer and the oven we use for curing plastic. At 70F, our cover was rigid and the East German cover could flex a bit. I started the oven off at 200 degrees and kept checking every 15 minutes and the East German cover started to soften first. 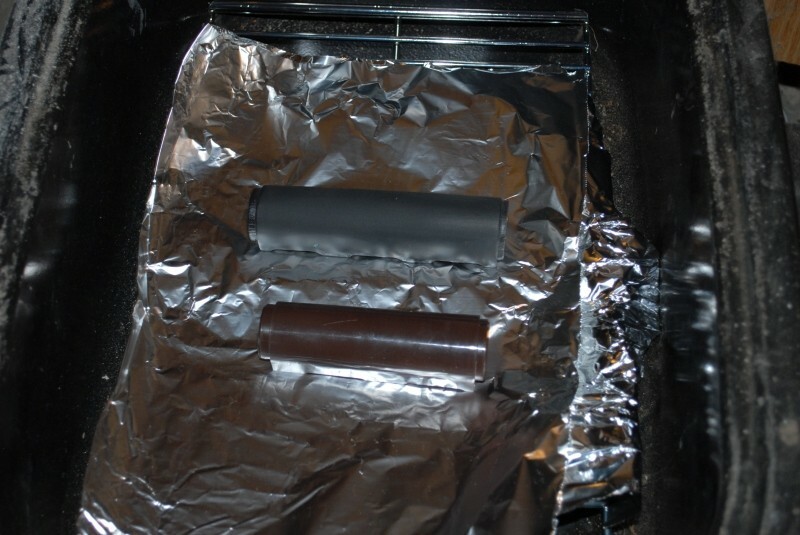 At 250F, the East German cover was very flexible and at 300F I could almost get it to touch its sides together. Our’s was starting to bend some. By the time we reached 437F, the East German cover was melting like a stick of butter while our’s was very soft but did not melt. 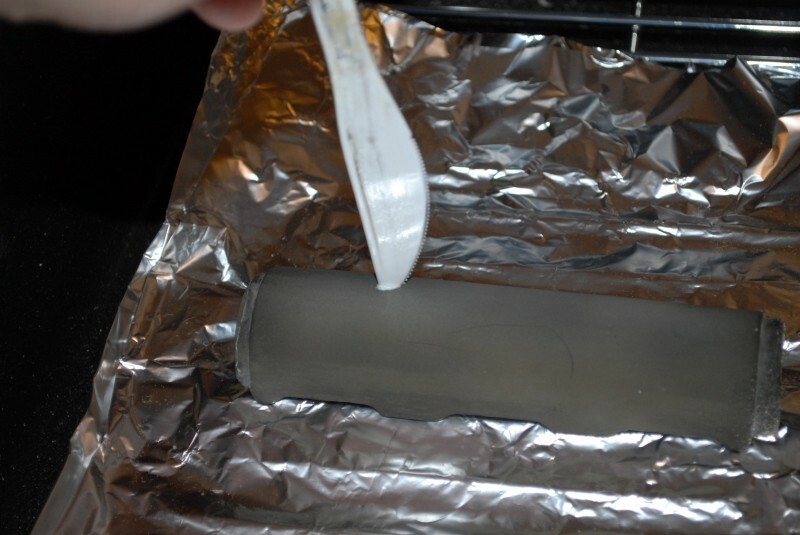 The cover was soft but it then hardened again as it cooled off. I then sprayed the oxidized looking urethane with WD40 and it brought it back to more of its original color. 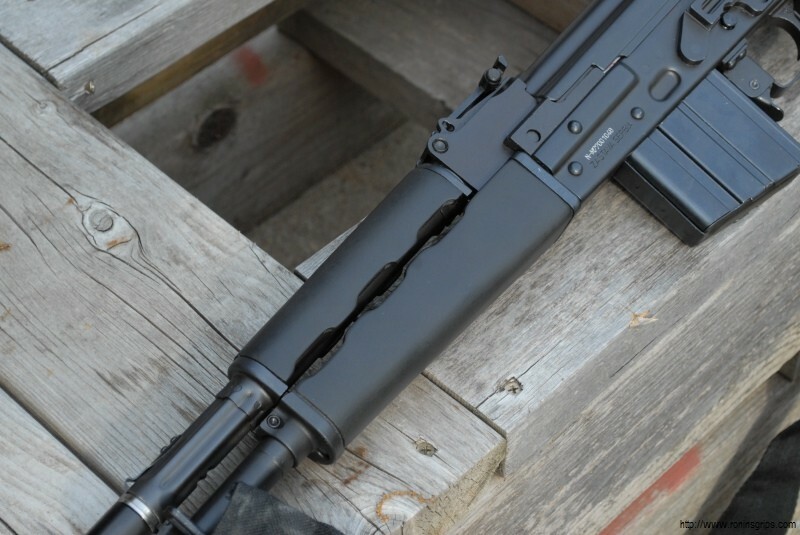 Maybe the best answer I can give to folks asking how our handguards have held up – we’ve sold hundreds of the M85/M92 handguards and we haven’t had any complaints that they melted or did not hold up. If you search on the Internet, I don’t think you will find any reports either. But with that said, I do have to remind folks that all materials have a limit. 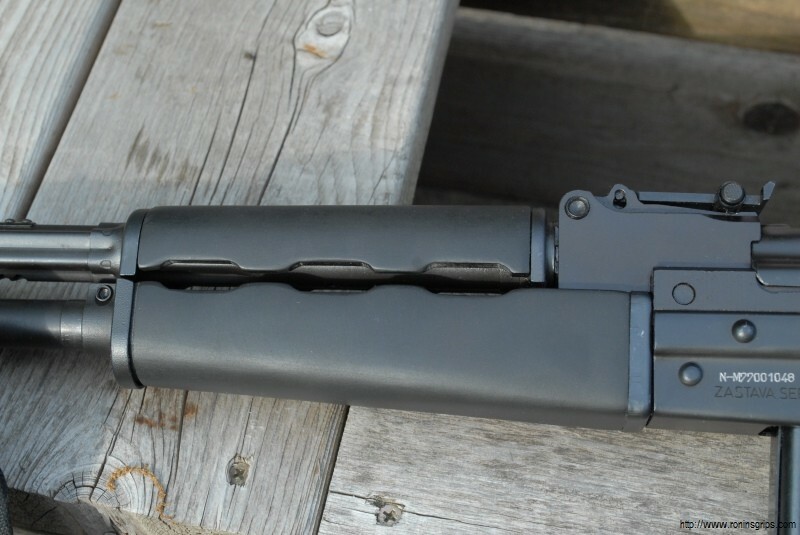 If you start dumping drum after drum while bumpfiring or going full auto and the barrel is literally red hot, no handguard is going to survive that without being damaged or even destroyed. That is the only reason we do not warrant our handguards against high-heat – we know there are limits and we know there are guys who will push past those limits. For most people, our handguards will work just fine. I use them myself and have never had a problem with my family and friends at the range doing target shooting. I’ve had a few guys ask about how Ronin’s Grips started over four years ago. 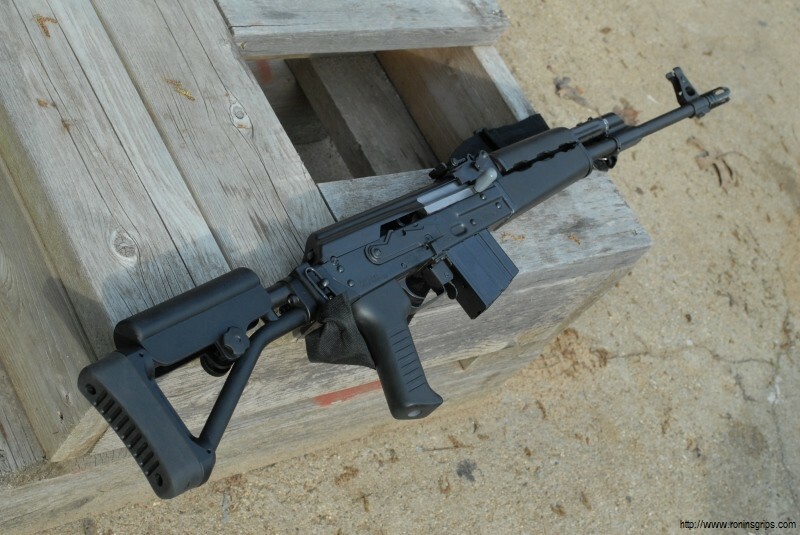 Basically, I needed a grip for a Yugo M70 and I couldn’t find one. It’s as simple as that. Some guys were talking about casting them and it dawned on me that I knew how to make them but just had to figure out the materials and best process that I could do in my small shop. Needless to say it has grown on me. I am deeply indebted to the guys on www.AKfiles.com for helping me get started and I sold grips on the Marketplace subforum for the first year or so before I started the website. It has been an amazing four years and I can honestly say that overwhelming majority of American gun owners are awesome people – smart, honest, want to help and so forth. 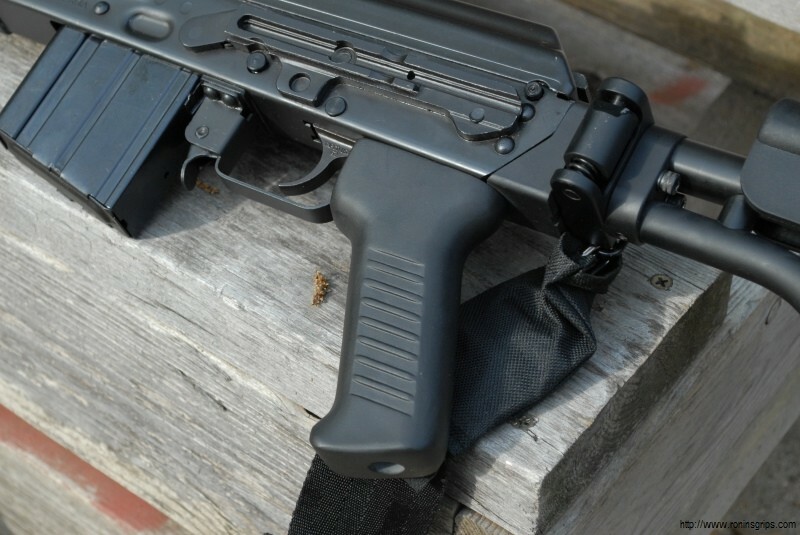 Once I realized that I actually had a business running – it kind of hit me one day that it was no longer a hobby -I knew that in order to compete that I had to stick in a niche where the big boys couldn’t play – that of specialized AK grips and furniture to help guys with 922r compliance. I understood the market, believed in the reliability of the rifles and just found the engineering around them fascinating in general. With this said, our furniture for AK rifles serves as the core of our business. 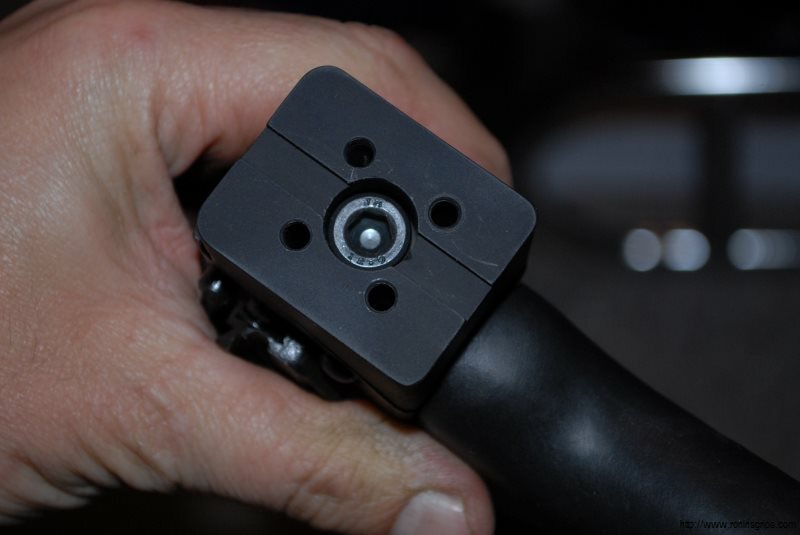 As Ronin’s Grips grew, I realized that there were three key ingredients we needed to never lose sight of: to turn out the best products we can, always stand behind them and take care of customers. I know a lot of groups make comments like that but let me explain. First, we make every product by hand for each order. We aren’t some big company with an injection molding machine cranking out thousands of identical parts per day. 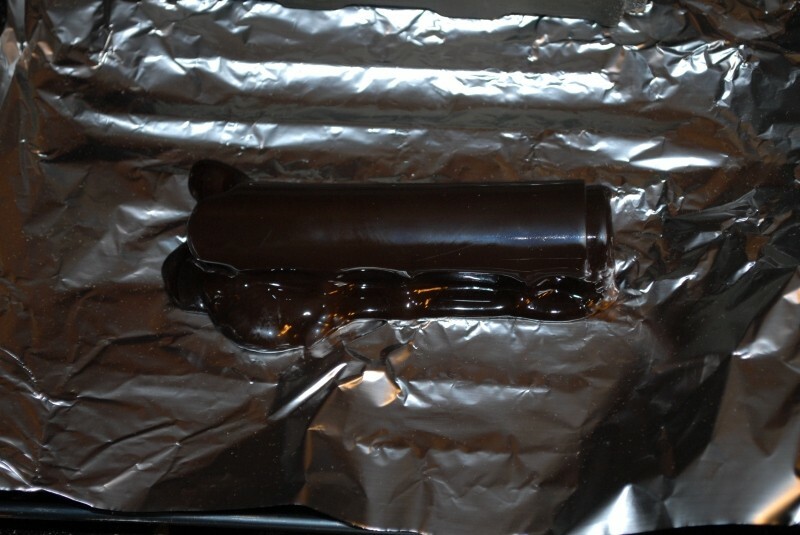 Instead, we mix the plastic, add the coloring and pour the liquid into the molds. We then drill, sand and polish all by hand. Nothing fancy – just plain good old fashioned hard American work and pride. It takes time and every product we produce is as unique as the guys that use them. In short, our products have “character”. Second, we stand behind our products. It’s amazing to look back at the thousands of products we have made over the last four years to almost as many customers. Whenever there is a problem with a product, we strive to make it right. We really believe it is only right to stand behind what we make. We know guys are using our products with their families and their friends. We know they want to use them hard and hand them down. We try really hard to do things the right way and we are still learning about how to do things better. Third, to us, the customer really matters – you really matter. We know that you work hard for your money and are proud of your firearms. We must earn and keep your trust and that only happens through delivering excellent customer service made up of honesty, respect and perseverance. We take to heart the old saying that one should treat others how they want to be treated. Mistakes happen but more than anything, I want you guys to know we will make things right – we will take care of you. I would like to think the three beliefs I just listed are what make us different. We are growing largely though word of mouth plus we have a ton of repeat customers. To me, that must mean we are doing some things right but I also know we must continually try to improve and not sit on our laurels. I hope this gives you a bit of insight about us – that there is a lot more than just products on a web page for sale — that we really believe in providing you with value. From me and my family to all of you – thank you very much.